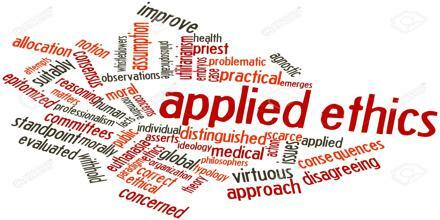 Applied Ethics is the actual application of ethical theory for the purpose of choosing an ethical action in a given issue. It is usually divided into various fields. It is the philosophical examination, from a moral standpoint, of particular issues in private and public life which are matters of moral judgment. It is distinguished from normative ethics, which concerns what people should believe to be right and wrong, and from meta-ethics, which concerns the nature of moral statements.